The pathogenesis of melasma remains poorly understood and its treatment continues to be challenging. With approximately 10% cases occurring in men, it has become a universal, across the gender disorder. The disease prevalence among Asians is about 40% in females and about 20% in males. Melasma is the most common pigmentary disorder in India, with incidence of approximately 10%. It is also found to occur at a younger age among Indians. There have been numerous advances in the understanding and management of melasma. This review attempts to look at these newer vistas in melasma. Literature search was done from PubMed, the Cochrane Library, MEDLINE and Embase using the key word "melisma," "melasma pathogenesis" and "melasma treatment." Multiple factors have been incriminated in the pathogenesis of melasma. The current concepts include. This leads to falling off or migration of active melanocytes and melanin into the dermis and may be responsible for the persistent hyperpigmentation in melasma. Increased sun exposure and genetic factors are considered the two most important etiological factors. UV rays lead to lipid peroxidation of cellular membranes resulting in free radical production and finally increased melanin production. All the wavelengths emanating from sunlight, including visible light can induce melasma. Though considered physiological in pregnancy, it hardly regresses 100% after delivery. Estrogens, progesterones and increased MSH are all incriminated. The reduced incidence in postmenopausal women and in men supports the role of hormones. Estrogen acting on estrogen receptors present on melanocytes may stimulate these cells to produce extra melanin. Increased luteinizing hormone with lower serum estradiol due to ovarian dysfunction could also be a reason. Thyroid dysfunction and anti-thyroid antibodies may sometimes be associated with melasma. The centrofacial variant is described as being most common worldwide [Figure 1]. However, in India the malar region is more frequently involved (73%). Rarely other sun-exposed regions like extensors of the forearm may be involved. The classification of melasma into the four histopathological types aided by Wood's lamp examination is not entirely fool proof. There may not always be a good correlation between Wood's lamp findings and histopathology. A recent classification divides melasma into transient and persistent variants depending on natural history. Lesions disappearing within a year of stopping any risk factors like oral contraceptive pills or after pregnancy is classified as transient while lesions present even after 1 year of absence of any risk factors is called persistent. The persistence is due to persisting sun exposure. 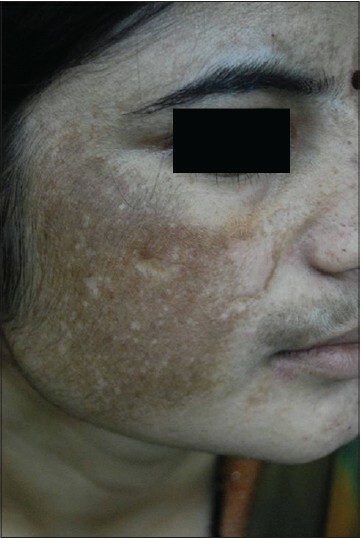 Dermoscopy of melasma lesions demonstrate a fine brown reticular pattern superimposed on a background of faint light brown structureless areas. This can be differentiated from exogenous ochronosis that shows dark brown globules and globular structures on diffuse brown background. Objective measurement of the melanin content can be done with an instrument called Mexameter and also by confocal microscopy. Melasma treatment can be very frustrating as many modalities can turn out to be ineffective. Dermal and mixed variants are quite resistant to therapy. Most patients seek medical help much after the onset of the condition, making treatment even more difficult. Medical management of melasma comprises mainly of sunscreens and skin lightening agents. Sunscreens are an important part of treatment strategy in melasma. All wavelengths of sunlight, including the visible spectrum, are capable of inducing melasma. Most commercial sunscreens do not block wavelengths >380 nm and therefore melasma patients are not protected from the longer UVA wavelengths and visible light, which cause most of the pigmentation. Hence a broad spectrum sunscreen with both UV and visible light protection is most useful in this condition. , The minimum level of UVA protection factor (UVAPF) has been set at a standard of at least one-third of the sun protection factor (SPF), hence a SPF/UVAPF ratio <3 is a minimum for providing adequate sun protection. Also for Indians, minimum UVAPF required is 12-17 in winter and a maximum of 29-30 in summer. Sunscreens in the visible light range usually contain absorbing pigments such as iron oxides. Therefore adding this component to sunscreens increases their photoprotection capacities. In order to reach balanced sun protection, a combination of UV filters is, therefore, necessary. 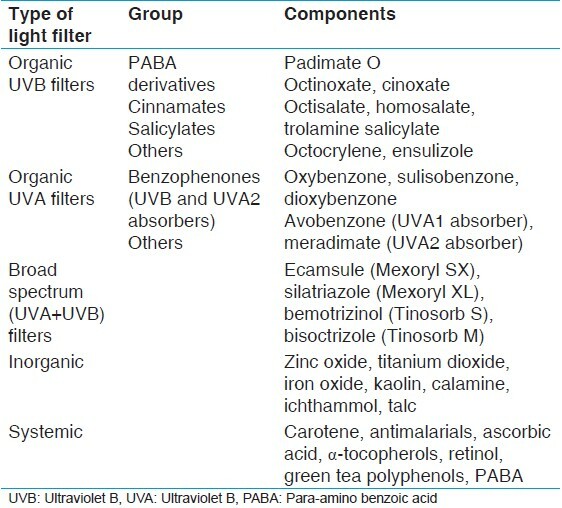 So while selecting UV filters, they should have different maximum absorbance peaks (UVB, short UVA, long UVA) to cover entire UV spectrum, have appropriate phases of sunscreen emulsion (lipophilic and hydrophilic), and the combination has to be photostable. Two hourly applications between 8 am and 4 pm are recommended. The presently available sunscreen components are as given in [Table 1]. New technologies like sunspheres and microencapsulation are the new kids on the block. Sunspheres have polymer beads filled with water that do not absorb UV irradiation, but enhance effectiveness of the active sunscreen ingredients. Microencapsulation has active sunscreen ingredients entrapped within a silica shell making it inert and making it possible to combine incompatible sunscreen ingredients safely without loss of efficacy. It still remains the most prescribed bleaching agent globally and remains the gold standard for management of hyperpigmentation. High absorption from skin and exogenous ochronosis are anticipated side effects [Figure 2]. A peculiar side effect of guttate hypomelanosis can develop in melasma lesions with use of more than 2% hydroquinone (HQ). 4-methoxyphenol, 4-isopropylcatechol, 4-hydroxyanisole and N-acetyl-4-S-cysteaminylphenol are some of the HQ derivatives, which have been tried with reasonable success. Over the last few years, milder steroids have been replaced by potent steroids in triple combinations. This has led to increased side effects. Facial skin becomes atrophied due to the regular use of steroids resulting in extreme sensitivity towards sun exposure. The atrophy also leads to appearance of increased area of involvement in melasma. Such facial skin also becomes intolerant to the commonly used drugs in melasma. Clobetasol and betamethasone among potent steroids, mometasone in the mid-range and hydrocortisone among low potent steroids are the commonly used topical steroids in various triple combinations. The potent steroids should not be used for more than 4 weeks, should preferably be tapered to low potent steroids which should also be stopped in another 2 months. It is especially useful in photodamaged and darker skin. Tretinoin 0.025-0.1% and adapalene 0.1% are the preferred preparations. Tazarotene, all trans-retinoic acid and isotretinoin have also been used with no added advantage being found over tretinoin. It is a derivative of HQ, acts by competitively inhibiting formation of melanin precursors. It is reportedly more effective than HQ with lesser side-effects. It is available as 2% solution containing in addition 0.01% retinoic acid, though it is still not marketed in India. In addition to its antioxidant effect, it affects melanin production by converting dopaquinone to its reduced derivative DOPA. It inhibits free radical production as also absorption of UV rays. Vitamin C may also chelate copper ions thus blocking tyrosinase activity. The advantage of this 5% topical preparation is almost nil side effects. Magnesium ascorbyl phosphate, a more stable ester is the most prominent among them and it also protects against UVB pigmentation. Iontophoresis has been found to increase its penetration and efficacy. Niacinamide is the active amide of niacin. It reduces pigmentation by preventing transfer of the melanosomes to keratinocytes. It has however no effect on tyrosinase. It is obtained from the root of Glycyrrhiza glabra, a herb. Glabridin and Liquiritin are derivatives of liquorice which have shown benefit. Glabridin in addition to tyrosinase inhibition also has anti-inflammatory properties. It acts by dispersing melanin and removing epidermal stains. It is a structural analog of vitamin A, which acts as agonist to vitamin A, saturates melanocyte receptors and reduce melanin production. It requires a prolonged duration of treatment but has few side effects. It is another monounsaturated dicarboxylic acid mainly derived by biofermentation of oleic acid. It interferes with melanin synthesis by binding agonistically to nuclear peroxisome receptor which thereby regulates tyrosinase transcription and inhibits melanosome transfer. 1% dioic acid for 12 weeks is giving good results in few studies. They act against tyrosinase, TRP-1 and TRP-2 at the molecular level by interacting with translation of targeted mRNA. N-acetyl glucosamine, soybean extract, mulberry extract, thiotic acid, phenolic-thioether, cinnamic acid, pidobenzone, silymarin, 4-isopropylcatechol and linoleic acid with lincomycin. The medical therapies are summarised in [Table 2]. Kligman and Willis first popularised the combination of HQ 5%, tretinoin 0.1% and dexamethasone 0.1%. Various modifications of this regime have been formulated over the decades. Gano and Garcia had used 2% HQ along with 0.05% tretinoin and in addition 0.1% betamethasone valerate. Food and Drug Administration (FDA) had approved a modified Kligman's formulation which contains 0.05% tretinoin, 4% HQ and 0.01% fluocinolone acetonide. In a multicentric study performed in 569 subjects with moderate or severe melasma over 12 months, the melasma resolved in 80% subjects in 1 year. Triple combination therapy takes 4 weeks to show significant improvement and 8 weeks for maximum results. These combinations are presently considered as the first line therapies in melasma. However the FDA approved combination should not be used for more than 8 weeks continuously at a time. Serial use of glycolic acid peels also significantly improves clinical efficacy of modified Kligman's formula. Glycolic acid in combination with HQ enhances the penetration of HQ. Other combinations include azelaic acid 20% with tretinoin 0.05 or 0.1%, azelaic acid 20%, HQ 4% and glycolic acid 20%, mequinol 2% with tretinoin 0.01%, HQ 2% and kojic acid 2% with glycolic acid 10% and mequinol 2% with 0.01% tretinoin. Combinations of sunscreens with demelanising agents are also commonplace. Pigmentary Disease Academy has recommended topical application of triple combination cream as the first line therapy in melasma. Dual and monotherapies have slower onset of action and have lower efficacy. Hence they are recommended for use in patients intolerant to the triple therapy or wherein triple therapy is unavailable. Continuation of 2% HQ low dose as maintenance therapy is recommended. Glycolic acid, trichloraacetic acid (TCA) and salicylic acid are the peeling agents which have stood the test of time in the treatment of melasma. They are generally combined along with medical treatment for better and rapid clearance. They work well in epidermal and mixed variants of melasma. They are also helpful in the dermal variant by inducing inflammation and by helping macrophages in phagocytosing stagnant melanin. They continue to be the most often used peels in melasma. 50-70% concentrations are the most commonly used. They are safe and are repeated once in 3-4 weeks for a minimum of 3-4 peels. Significant reductions in MASI has been achieved in 91% of subjects with epidermal forms responding better than mixed and dermal type not responding at all. Combination with medical therapy are useful in resistant cases when faster response is needed. Beginners usually should start at 10-15%. Concentrations upto 25% are usually used in Indian skin. TCA shows rapid but unpredictable response and has significant local reactions and relapse rate. Glycolic acid has slower onset, but incidence of local irritant reactions is lesser. Hence, TCA is better used initially to get rapid response followed by glycolic acid as maintenance. Effects are comparable to 70% glycolic acid. Arginine, lactic acid, pyruvic acid and mandelic acid are newer peels which have better safety profile and are increasingly being used now-a-days. Lactic acid is a relatively cheaper and safer agent for chemical peeling. Full strength lactic acid solution (92%) has been found to be effective in few studies. 50% pyruvic acid, an alpha keto acid is also being used in few countries, but its unpredictability is a matter of concern. Mandelic acid, a large molecule, penetrates epidermis very slowly and with uniformity and so is very good for patients with sensitive skin [Figure 3]. A lipophilic derivative of the salicylic acid, namely lipo-hydroxy acid, has newly been introduced. Used in concentrations of 5-10%, with a pH closer to normal skin pH and not requiring neutralization, it is likely to be a more popular agent in the future. Tretinoin peels are left for 4-5 h before being washed away. Amino fruit acids are the latest in this group and they are still under evaluation. • Jessner's solution with 20% TCA. The pigmentary improvement which occurs after platelet rich plasma (PRP) is probably more related to increase in the skin volume. Platelet derived growth factors found in PRP are involved in hyaluronic acid synthesis which increases skin tone and volume, thereby providing a more glowing skin with a feeling of reduced pigmentation. These light devices work over wavelengths of 515-1200 nm. They have shown moderately satisfying results in melasma refractory to topical therapy. Cut-off filters with delivery of specific wavelengths and lower fluencies can reduce side effects. There is a downtime of 1-2 weeks and sessions are repeated every 3-4 weeks. Erbium YAG and CO 2 are not preferable for skin Types IV to VI due to high chances of scarring and postprocedure pigmentary changes. Combination of erbium: YAG laser (2940 nm) with glycolic acid peels has been shown to improve refractory melasma after 6 months. However these methods are risky due to the pigmentary problems postprocedure. This is a new method of treatment in melasma. Transdermal elimination of melanophages takes place with lesser postinflammatory hyperpigmentation. Improvements to the tune of 80% have been registered 26-28 weeks after one session of fractional photothermolysis. Energy settings between 6 mJ and 8 mJ with a density setting of 250 MTZs/cm 2 with total density of 2000 MTZ/cm 2 is usually the ideal setting. Three treatment passes are used with one third horizontal and vertical overlap. It is useful in therapy resistant cases. Sessions can be repeated 3 weekly with improvement marked at 6 months postprocedure. Initial erythema for 2 days, followed by hyperpigmentation of 3-4 days, is the usually observed side effect. 60% of patients reported 75-100% clearances in a study on fractional lasers in melasma. The limitations are mainly in darker skin where efficacy and improvement are limited and recurrence rates are high. The wavelength of 1550 nm allows penetration in dermis up to 300-1400 μm depth leading to benefits in the treatment of dermal and mixed melasma. Energy of 6-12 mJ with once in 4 week sessions for 4 sessions is the average duration of prescription. This new modality with wavelength of 694 nm, pulse width of 40ns and spot size of 7.1 mm × 7.1 mm is being used successfully in certain centers. Fluences of 2-3 J/cm 2 with 6 sessions at 2 week intervals covering the whole face 3 times per session is found ideal for this therapy. This wavelength is more strongly absorbed and is definitely more selective for melanin than the similar Nd:YAG variant and should therefore be more useful in the times to come. It is however not a popular laser in India. May provide better relief. The 950 μ/s pulsed CO 2 laser in one pass at 300 mJ/cm 2 decreases the hyperpigmentation by removing the entire epidermis and destroying melanocytes. Following this, the application of Q switched alexandrite laser at 6 J/cm 2 can target dermal melanin. These are still not popular in this part of the world. Oral tranexamic acid in combination with the Q switched lasers is also proving to be beneficial. Performing a test spot is advised before any laser procedure. Premedication with HQ for 4 weeks and antiviral prophylaxis against herpes simplex are also advocated. Addition of chemical peels reduces the hyperpigmentation and improves efficacy of lasers. Lasers do not alter the basic pathomechanisms of melasma namely genetic influences, sun exposure and hormonal factors. Lasers rarely give reproducible and long standing improvement and recurrence almost always occurs. The high cost and risk of adverse effects place them as second line therapies for melasma. Medical management and chemical peels should ideally go hand in hand along with the laser therapy. An algorithm for management of melasma is given in [Table 3]. Quality of life in melasma can be assessed by the MELASQOL, an instrument consisting of a 10 question scale, on which patients are assessed on each question by a rating from 1 to 7 based on the Likert scale. Questions were based on physical, emotional, social and financial well-being. Scores range from 7 to 70 with higher scores indication worse quality of life. The other indices which can be used include DLQI, SKINDEX-16 and HRQoL. Treatment of melasma is very challenging. The relapsing tendency, dermal component which is difficult to treat and emotional swings associated with the condition are definite parts of the challenge. Strict sun protective measures by regular usage of sunscreens do offer some protection against relapse, but it is not absolute. So, treatment regimens must offer prolonged remission and in addition have to be safe to use for that prolonged period. Combination of HQ with topical tretinoin and steroids is considered first line therapy. Many new agents have been developed, though none have been ratified by controlled clinical trials. Dermal pigmentation however will take longer to regress than epidermal pigmentation as no therapy is generally effective in removing the dermal pigment. But treatment shouldn't be withheld even if there is a preponderance of mainly dermal pigment as the source of this pigment is also the epidermis, and even if epidermal melanogenesis can only be inhibited for prolonged periods, dermal pigment will not be replenished and will usually slowly resolve. Indian skin being darker and also being exposed to strong sunlight compounds the problem. So deep peels, are to be definitely avoided in Indians. Approach to treatment depends on type and severity of melasma. Sivayathorn A. Melasma in orientals. Clin Drug Invest 1995;10:34-40. Pathak MA, Fitzpatrick TB, Kraus EW. Usefulness of retinoic acid in the treatment of melasma. J Am Acad Dermatol 1986;15:894-9. Torres-Álvarez B, Mesa-Garza IG, Castanedo-Cázares JP, Fuentes-Ahumada C, Oros-Ovalle C, Navarrete-Solis J, et al. Histochemical and immunohistochemical study in melasma: Evidence of damage in the basal membrane. Am J Dermatopathol 2011;33:291-5. Kim EJ, Park HY, Yaar M, Gilchrest BA. Modulation of vascular endothelial growth factor receptors in melanocytes. Exp Dermatol 2005;14:625-33. Bak H, Lee HJ, Chang SE, Choi JH, Kim MN, Kim BJ. Increased expression of nerve growth factor receptor and neural endopeptidase in the lesional skin of melasma. Dermatol Surg 2009;35:1244-50. Kang HY, Hwang JS, Lee JY, Ahn JH, Kim JY, Lee ES, et al. The dermal stem cell factor and c-kit are overexpressed in melasma. Br J Dermatol 2006;154:1094-9. Maeda K, Naganuma M. Topical trans-4-aminomethyl cyclohexanecarboxylic acid prevents ultraviolet radiation- induced pigmentation. J Photochem Photobiol B 1998;47:136-41. Carlson JA, Linette GP, Aplin A, Ng B, Slominski A. Melanocyte receptors: Clinical implications and therapeutic relevance. Dermatol Clin 2007;25:541-57, viii. Pérez M, Sánchez JL, Aguiló F. Endocrinologic profile of patients with idiopathic melasma. J Invest Dermatol 1983;81:543-5. 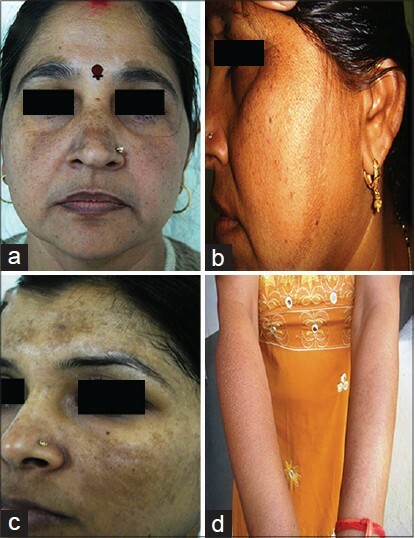 Kanwar AJ, Dhar S, Kaur S. Treatment of melasma with potent topical corticosteroids. Dermatology 1994;188:170. Kimbrough-Green CK, Griffiths CE, Finkel LJ, Hamilton TA, Bulengo-Ransby SM, Ellis CN, et al. Topical retinoic acid (tretinoin) for melasma in black patients. A vehicle-controlled clinical trial. Arch Dermatol 1994;130:727-33. Pandya AG, Hynan LS, Bhore R, Riley FC, Guevara IL, Grimes P, et al. Reliability assessment and validation of the Melasma Area and Severity Index (MASI) and a new modified MASI scoring method. J Am Acad Dermatol 2011;64:78-83.e1. Clarys P, Alewaeters K, Lambrecht R, Barel AO. Skin color measurements: Comparison between three instruments: The Chromameter (R), the DermaSpectrometer (R) and the Mexameter (R). Skin Res Technol 2000;6:230-38. Ardigo M, Cameli N, Berardesca E, Gonzalez S. Characterization and evaluation of pigment distribution and response to therapy in melasma using in vivo reflectance confocal microscopy: A preliminary study. J Eur Acad Dermatol Venereol 2010;24:1296-303. Sheth VM, Pandya AG. Melasma: A comprehensive update: Part II. J Am Acad Dermatol 2011;65:699-714. Moyal D. Need for a well-balanced sunscreen to protect human skin from both Ultraviolet A and Ultraviolet B damage. Indian J Dermatol Venereol Leprol 2012;78 Suppl 1:S24-30. Moyal D. The development of efficient sunscreens. Indian J Dermatol Venereol Leprol 2012;78 Suppl 1:S31-4. Nguyen QH, Bui TP. Azelaic acid: Pharmacokinetic and pharmacodynamic properties and its therapeutic role in hyperpigmentary disorders and acne. Int J Dermatol 1995;34:75-84. Halder RM, Richards GM. Topical agents used in the management of hyperpigmentation. Skin Therapy Lett 2004;9:1-3. Lowe NJ, Rizk D, Grimes P, Billips M, Pincus S. Azelaic acid 20% cream in the treatment of facial hyperpigmentation in darker-skinned patients. Clin Ther 1998;20:945-59. Baliña LM, Graupe K. The treatment of melasma 20% azelaic acid versus 4% hydroquinone cream. Int J Dermatol 1991;30:893-5. Farshi S. Comparative study of therapeutic effects of 20% azelaic acid and hydroquinone 4% cream in the treatment of melasma. J Cosmet Dermatol 2011;10:282-7. Lynde CB, Kraft JN, Lynde CW. Topical treatments for melasma and postinflammatory hyperpigmentation. Skin Therapy Lett 2006;11:1-6. Kahn V. Effect of kojic acid on the oxidation of DL-DOPA, norepinephrine, and dopamine by mushroom tyrosinase. Pigment Cell Res 1995;8:234-40. Lim JT. Treatment of melasma using kojic acid in a gel containing hydroquinone and glycolic acid. Dermatol Surg 1999;25:282-4. Cameli N, Abril E, Mariano M, Berardesca E. Combined use of monopolar radiofrequency and transdermal drug delivery in the treatment of melasma. Dermatol Surg 2014;40:748-55. Bang SH, Han SJ, Kim DH. Hydrolysis of arbutin to hydroquinone by human skin bacteria and its effect on antioxidant activity. J Cosmet Dermatol 2008;7:189-93. Chawla S, deLong MA, Visscher MO, Wickett RR, Manga P, Boissy RE. Mechanism of tyrosinase inhibition by deoxyArbutin and its second-generation derivatives. Br J Dermatol 2008;159:1267-74. Jarratt M. Mequinol 2%/tretinoin 0.01% solution: An effective and safe alternative to hydroquinone 3% in the treatment of solar lentigines. Cutis 2004;74:319-22. Jimbow K. N-acetyl-4-S-cysteaminylphenol as a new type of depigmenting agent for the melanoderma of patients with melasma. Arch Dermatol 1991;127:1528-34. Espinal-Perez LE, Moncada B, Castanedo-Cazares JP. A double-blind randomized trial of 5% ascorbic acid vs 4% hydroquinone in melasma. Int J Dermatol 2004;43:604-7. Kobayashi S, Takehana M, Itoh S, Ogata E. Protective effect of magnesium-L-ascorbyl-2 phosphate against skin damage induced by UVB irradiation. Photochem Photobiol 1996;64:224-8. Ichihashi M, Funasaka Y, Ohashi A, Chacraborty A, Ahmed NU, Ueda M, et al. The inhibitory effect of DL-alpha-tocopheryl ferulate in lecithin on melanogenesis. Anticancer Res 1999;19:3769-74. Greatens A, Hakozaki T, Koshoffer A, Epstein H, Schwemberger S, Babcock G, et al. Effective inhibition of melanosome transfer to keratinocytes by lectins and niacinamide is reversible. Exp Dermatol 2005;14:498-508. Yokota T, Nishio H, Kubota Y, Mizoguchi M. The inhibitory effect of glabridin from licorice extracts on melanogenesis and inflammation. Pigment Cell Res 1998;11:355-61. Shimogaki H, Tanaka Y, Tamai H, Masuda M. In vitro and in vivo evaluation of ellagic acid on melanogenesis inhibition. Int J Cosmet Sci 2000;22:291-303. Kasraee B, Safaee Ardekani GH, Parhizgar A, Handjani F, Omrani GR, Samani M, et al. Safety of topical methimazole for the treatment of melasma. Transdermal absorption, the effect on thyroid function and cutaneous adverse effects. Skin Pharmacol Physiol 2008;21:300-5. Kligman AM, Willis I. A new formula for depigmenting human skin. Arch Dermatol 1975;111:40-8. Gano SE, Garcia RL. Topical tretinoin, hydroquinone, and betamethasone valerate in the therapy of melasma. Cutis 1979;23:239-41. Torok H, Taylor S, Baumann L, Jones T, Wieder J, Lowe N, et al. A large 12-month extension study of an 8-week trial to evaluate the safety and efficacy of triple combination (TC) cream in melasma patients previously treated with TC cream or one of its dyads. J Drugs Dermatol 2005;4:592-7. Sarkar R, Bhalla M, Kanwar AJ. A comparative study of 20% azelaic acid cream monotherapy versus a sequential therapy in the treatment of melasma in dark-skinned patients. Dermatology 2002;205:249-54. Hori I, Nihei K, Kubo I. Structural criteria for depigmenting mechanism of arbutin. Phytother Res 2004;18:475-9. Guevara IL, Werlinger KD, Pandya AG. Tolerability and efficacy of a novel formulation in the treatment of melasma. J Drugs Dermatol 2010;9:215-8. Ortonne JP, Passeron T. Melanin pigmentary disorders: Treatment update. Dermatol Clin 2005;23:209-26. Sharquie KE, Al-Tikreety MM, Al-Mashhadani SA. Lactic acid as a new therapeutic peeling agent in melasma. Dermatol Surg 2005;31:149-54. Philips N, Smith J, Keller T, Gonzalez S. Predominant effects of Polypodium leucotomos on membrane integrity, lipid peroxidation, and expression of elastin and matrixmetalloproteinase-1 in ultraviolet radiation exposed fibroblasts, and keratinocytes. J Dermatol Sci 2003;32:1-9. Kodali S, Guevara IL, Carrigan CR, Daulat S, Blanco G, Boker A, et al. 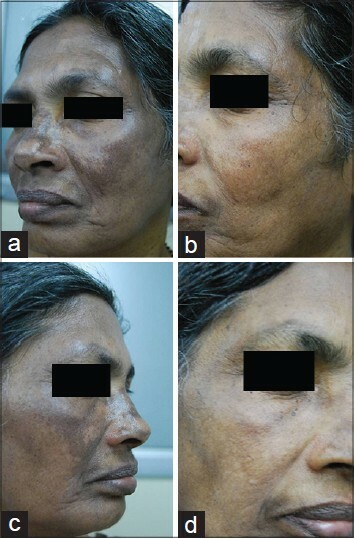 A prospective, randomized, split-face, controlled trial of salicylic acid peels in the treatment of melasma in Latin American women. J Am Acad Dermatol 2010;63:1030-5. Berardesca E, Cameli N, Primavera G, Carrera M. Clinical and instrumental evaluation of skin improvement after treatment with a new 50% pyruvic acid peel. Dermatol Surg 2006;32:526-31. Taylor CR, Anderson RR. Ineffective treatment of refractory melasma and postinflammatory hyperpigmentation by Q-switched ruby laser. J Dermatol Surg Oncol 1994;20:592-7. Uhoda E, Piérard-Franchimont C, Piérard GE. Comedolysis by a lipohydroxyacid formulation in acne-prone subjects. Eur J Dermatol 2003;13:65-8. Khunger N. Standard guidelines of care for chemical peels. Indian J Dermatol Venereol Leprol 2008;74:S15-2. Kunachak S, Leelaudomlipi P, Wongwaisayawan S. Dermabrasion: A curative treatment for melasma. Aesthetic Plast Surg 2001;25:114-7. Li YH, Chen JZ, Wei HC, Wu Y, Liu M, Xu YY, et al. Efficacy and safety of intense pulsed light in treatment of melasma in Chinese patients. Dermatol Surg 2008;34:693-700. Manaloto RM, Alster T. Erbium: YAG laser resurfacing for refractory melasma. Dermatol Surg 1999;25:121-3. Angsuwarangsee S, Polnikorn N. Combined ultrapulse CO2 laser and Q-switched alexandrite laser compared with Q-switched alexandrite laser alone for refractory melasma: Split-face design. Dermatol Surg 2003;29:59-64. Lee HI, Lim YY, Kim BJ, Kim MN, Min HJ, Hwang JH, et al. Clinicopathologic efficacy of copper bromide plus/yellow laser (578 nm with 511 nm) for treatment of melasma in Asian patients. Dermatol Surg 2010;36:885-93. Zhou X, Gold MH, Lu Z, Li Y. Efficacy and safety of Q-switched 1,064-nm neodymium-doped yttrium aluminum garnet laser treatment of melasma. Dermatol Surg 2011;37:962-70. Tannous ZS, Astner S. Utilizing fractional resurfacing in the treatment of therapy-resistant melasma. J Cosmet Laser Ther 2005;7:39-43. Rokhsar CK, Fitzpatrick RE. The treatment of melasma with fractional photothermolysis: A pilot study. Dermatol Surg 2005;31:1645-50. Naito SK. Fractional photothermolysis treatment for resistant melasma in Chinese females. J Cosmet Laser Ther 2007;9:161-3. Passeron T. Long-lasting effect of vascular targeted therapy of melasma. J Am Acad Dermatol 2013;69:e141-2. Niwa Massaki AB, Eimpunth S, Fabi SG, Guiha I, Groff W, Fitzpatrick R. Treatment of melasma with the 1,927-nm fractional thulium fiber laser: A retrospective analysis of 20 cases with long-term follow-up. Lasers Surg Med 2013;45:95-101. Nouri K, Bowes L, Chartier T, Romagosa R, Spencer J. Combination treatment of melasma with pulsed CO2 laser followed by Q-switched alexandrite laser: A pilot study. Dermatol Surg 1999;25:494-7. Jeong SY, Shin JB, Yeo UC, Kim WS, Kim IH. Low-fluence Q-switched neodymium-doped yttrium aluminum garnet laser for melasma with pre- or post-treatment triple combination cream. Dermatol Surg 2010;36:909-18. Balkrishnan R, McMichael AJ, Camacho FT, Saltzberg F, Housman TS, Grummer S, et al. Development and validation of a health-related quality of life instrument for women with melasma. Br J Dermatol 2003;149:572-7.